Noonan: Dara Calleary "is like an arsonist blaming the fire brigade"
The Finance Minister was accused of failing to deliver a deal on bank recapitalisation. MICHAEL NOONAN HAS described Fianna Fail job spokesman Dara Calleary as “like the arsonist that set fire to the building giving out to the fire brigade for not putting out the fire fast enough”. The Finance Minister was responding to accusations in the Dail this morning that he has failed to deliver a deal on retrospective recapitalisation for bailed-out Irish banks. He said that the Government had trumpted a 2012 agreement on the European Stability Mechanism as “a game changer” and “a big deal”. “Now it seems it’s wait and see”, he told the minister. 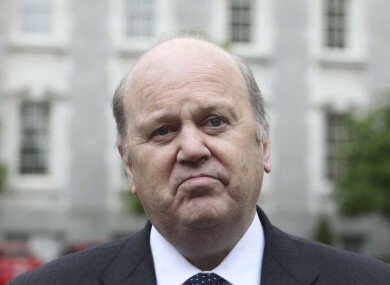 Noonan said that a decision will be made on whether or not to apply for retrospective bank recapitalisation in November, when it is anticipated the ESM will be in place. Last year a deal was struck that could allow retrospective applications to the €500 billion fund. Brussels, however, is reportedly playing down the possibility of a deal on recapitalisation of the Irish banks. In response to questioning from Sinn Fein finance spokesman Pearse Doherty, Noonan admitted that the departure of staff from Nama to private sector property companies was “an issue of concern”. He added that there was no current example of it causing a problem, but acknowledged that many employees may be tempted away from the state’s bad bank as it approaches its wind-up date. He said that he is “open to discussion” on remedies to the issue, including potentially a “golden handcuffs” deal for employees, whereby some of their remuneration would be conditional upon staying with the agency until a certain date. “There does seem to be a conflict…there is a massive concern that we’ve allowed that situation to develop”. Email “Noonan: Dara Calleary "is like an arsonist blaming the fire brigade"”. Feedback on “Noonan: Dara Calleary "is like an arsonist blaming the fire brigade"”.